A residual image while reading Sybil Baker’s well done novel While You Were Gone in the midst of the Kavanaugh hearing debacle playing itself out on national television: the requisite brightly-lit family portrait of said Supreme Court candidate being circulated to media outlets, smiling wife by his side, as well as the beaming countenances of his three young daughters. A picture that never tries hard enough to resonate on any level, stemming from its blatant artificiality, the nondescriptness of those in front of the camera, the lack of supporting detail. But, of course, this must be the wholesome veneer foisted upon our future Supreme Court justice, and one being juxtaposed with a picture of a much different man courtesy of Dr. Christine Blasey Ford. Meanwhile the roundtable hand-wringing continues over Mrs. Kavanaugh’s mental state based on observers reading her pained expressions and speculating over her anguish following Dr. Ford’s testimony. No one apparently bothers to ask about what the daughters may be thinking. While You Were Gone, on the other hand, ventures to where those newsy pundits fear to tread — or, at least, is willing to undertake the challenging task of piercing that unremarkable family portrait for the daughters’ sake. In this case, Baker’s story dissembles among three sisters from Chattanooga, Tennessee, each with their own motivations and desires, who also continue to weigh their present prospects against the dark legacy of the South to varying degrees. Along with a somewhat incomplete reconciling of this white family’s slave-owning past, these sisters balance the memories of their mother’s slow death from cancer years earlier with their present-day rallying around the widower father for dutifully celebrating his birthday in the shadow of what appears to be his onset Alzheimer’s. Casual disappointments and large failures for each of the sisters arrive in waves. Claire, the professionally ambitious eldest and role model, arrives at the apex of comfortable middle-class married existence finding it empty, and attempts to escape it all through an affair with an African-American colleague. Middle child Paige breaks loose to search for culture and fame in the Pacific Northwest with her rock band, only to get spat out of the scene by her own musical limitations and dilettantism. And Shannon, a would-be serious journalist stuck writing obituaries for the local paper, jealously pines for the happy, fulfilled life she believes she would have with a Korean photographer from a previous romance, minus his famous actor wife. With these figures and others, While You Were Gone frequently jumps multiple perspectives and texts, including a brief side plot set overseas, to create a complicating picture of these intertwined lives all regarding their separate possibilities that the novel thoughtfully explores. Circumstances thwart them, plans become undone, compromises are made. Everyone loses the one thing they take for granted. With faint gothic overtones of a Faulknerian saga, the past operates as something never resolved but an invitation to a perpetual haunting instead, one that is embraced, confronted, or, in the case of one of these sisters, entirely re-invented into a tenable future for the family that will know no center. At the heart of this story, too, lies the pedestrian enigma of Baker’s muted father figure, his resentments (and possible delusions) closest to himself, leaving only vague rejoinders to his daughters’ inquiries while he clasps a book in his hands. Readers may be forgiven for luring themselves into expecting that, based on the epigraphs from Shakespeare, the father is “playing Lear” with his smoldering grudges against the sisters and the surprising betrayal he inflicts upon them after his death when a mystery woman arrives in Chattanooga to settle the estate, though the novel, to its credit, doesn’t attempt to raise that development to overwrought dramatic heights. If anything, the sisters seem almost strangely conciliatory to this upheaval — a reaction perhaps closer in spirit to Chekhov’s Three Sisters, then, which the novel cites in tandem with King Lear — to the point of Shannon welcoming the opportunity to find out what any inquisitive daughter may suspect about her isolating father. Like his Shakespearean double, however, this particular father becomes the forebear of a rude awakening about to befall all three of his daughters: the inevitable pains of prolonged disappointment, and the harsh wages of ever ameliorating those in a secret life as Shannon finally begins learning about while meeting his hidden paramour after the funeral. The shaky equilibrium between what children owe their parents and vice versa is a steady refrain throughout, and Baker surmises how the traditional family unit must be undone first before its captives are able to pursue their own contented designs. 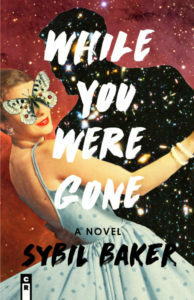 If the conclusion of While You Were Gone has the suspended air of an absent father leaving his daughters to a chaotic or unconventional future, it is because the novel puts hope in the next daughter up who will confront more directly these familial transgressions, unafraid of the potential repercussions of her not smiling for the family portrait. In keeping with the novel’s title, Baker reminds us that sometimes we can find our truest roles in the absence of those who held our gravity for the longest time. As these sisters come to these roles in their own ways, it is notable how the story always has the three supporting each other despite their personal misgivings and philosophical differences, never conspiring against each other’s aspirations. They collectively work towards another paradigm without that inexplicable transactional basis of fatherhood that had governed them from close or afar, such as Paige’s eventual realization of the joy of simply being in the face of stardom’s trappings and other higher pursuits, courtesy of her friendship with a talented recluse. Though the unspoken culprit for the nomadic state these sisters find themselves in may be something of a welcome afterthought by the conclusion, readers will sense While You Were Gone aptly paraphrases that familiar reckoning from Sylvia Plath: Daddy, we knew it was you all along. Forrest Roth is a Visiting Assistant Professor of English at Marshall University in West Virginia. His recent novel is Gary Oldman Is a Building You Must Walk Through (What Books Press, 2017), with his shorter fictions having appeared in NOON, Denver Quarterly, Juked, Timber, and other journals. Links can be found at www.forrestroth.blogspot.com.